The number of immigrants admitted to Canada each year evolves with projected population growth. 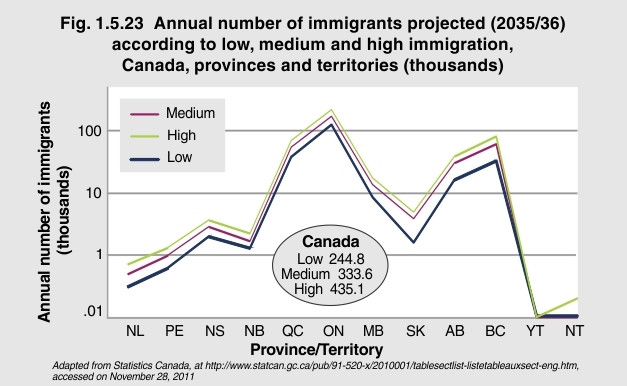 Under the low assumption for patterns of immigration set out by the 2009 Immigration Plan as formulated by Citizenship and Immigration Canada1, 244,800 people would immigrate to Canada in 2035/36; under the medium assumption, 333,600 immigrants would come; and under the high assumption, 435,100 would come. In each of the three scenarios, about 1/2 of all immigrants would settle in Ontario, just under 1/5th in British Columbia, about 1/8th in Québec and almost 1/10th in Alberta. The remainder would be scattered in pockets throughout the country. 1Statistics Canada. Population Projections for Canada, Provinces and Territories, 2009 to 2036. Catalogue no. 91-520-X. Statistics Canada: Ottawa. Canada’s population growth depends on immigration more than it does on natural increase. To plan workforce, housing, education and health care needs effectively requires that different patterns of immigration be considered. It is also critical to know where immigrants are most likely to settle. Current trends indicate that Ontario will continue to absorb the greatest proportion of new immigrants to Canada until 2036, followed by the Western Provinces and Québec. However, more new immigrants are considering life in the Prairies1.